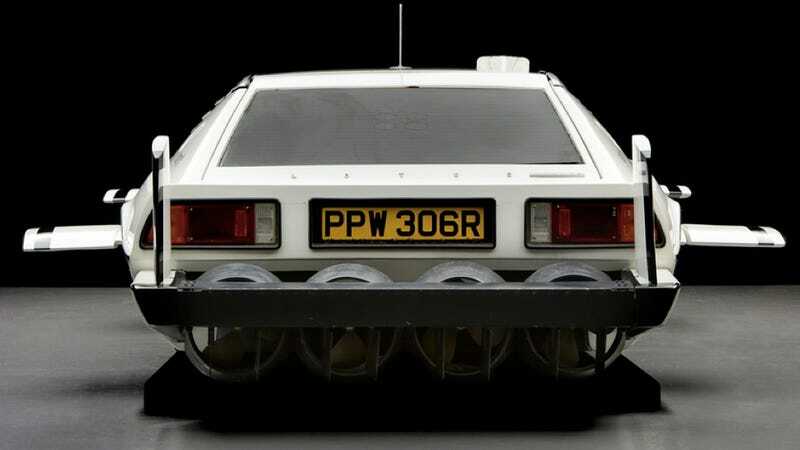 Sure, the Aston Martin DB5 is the car everyone thinks of when they think of Britain's suavest secret agent, but his best car is the impossibly cool Lotus Esprit submarine. And now it has sold, probably to an evil genius that definitely isn't me, for $866,000. The car, which is both a motoring and cinematic work of work, was just kind of tossed in a storage crate and forgotten like a pair of dirty old socks. It was discovered in 1989 by a guy who bought it for $100 and had never seen a Bond movie. Sounds better than that episode of Storage Wars where they got a rusty syringe. The Bond Esprit sold Monday for less than the expected $990,000 price, which is good, because I... I mean the buyer... didn't want to shell out full price. Still, $866,000 is nothing to sneeze at, depending on what you're allergic to. If you want to see the Esprit, please don't contact me. I definitely don't know where it is right now.